Cindra said, "the apron is in the mail," and of course I believed her. She is my beloved niece. 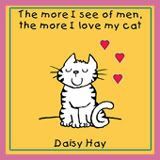 Except for biting me when she was two years old she has always been quite wonderful. So, when the apron never arrived at my home, I began to suspect one of my neighbors stole it. I began to look at them differently. Was it her? Was it him? Then Cindra sends me this*: My neighbors have been cleared. 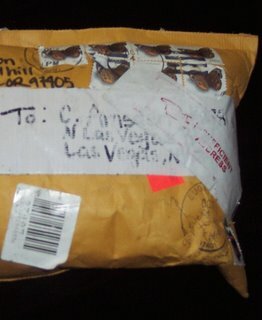 Apparently duct tape and Sharpie conspired to steal my package. Shame on them. *Picture edited to remove return address. _________ Sorry this post was late! I was without my HSI for 95 minutes tonight. A Cox Cable minion worked with me in a bored and barely civil manner. Despite the fact that I still could not access the internet he assured me all my Cox equipment was working and I needed to buy a new computer. Since this is a brand new IBM Pentium 4, and since my Cox HSI was the only non-functioning program, I chose not to embrace his diagnosis. Instead I tried the one thing he did NOT suggest I do. I unhooked and reconnected the cables and - ta da! -- connectivity. Hey, our wonderful tech guy is pretty wonderful. And I have enough stuff due Monday that you can be pretty sure I'm not having a three day weekend! Wifey and I recently recieved our blog cups from Dr. John. 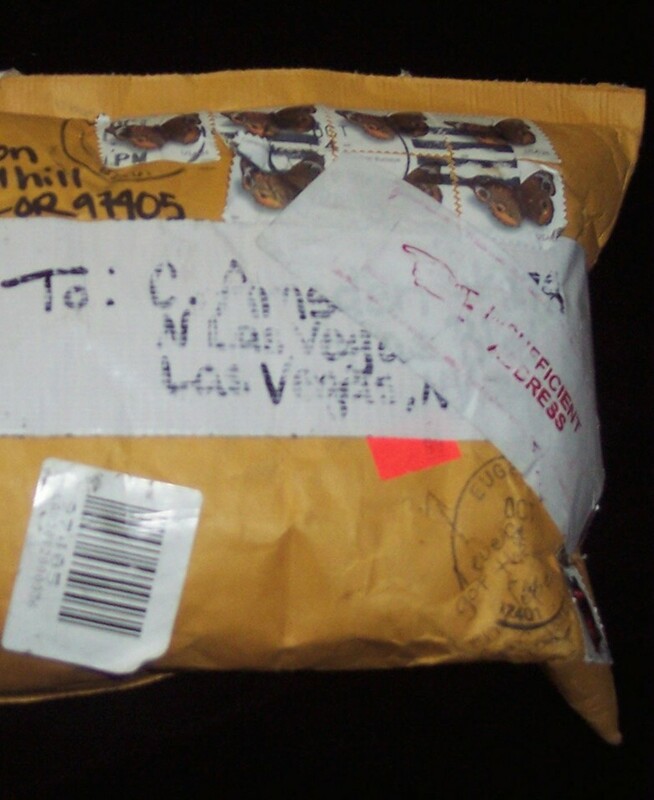 The parcel had a big piece of sticky tape on it saying it had been opened by Customs and Excise. I bet they were very envious. The postal service is still edgy, I suppose, adter 9-11. It's ad how far and how long the effects reverberate. Sounds like the COx techie needs to find a new job....don't they send you customer service questionnaires???? Enjoy your weekend anyway, balance out the work! Ah, my kingdom for an enthusiastic expert. you are hillarious..nothing like a midnight autumn giggle..lol..
glad you got the apron..treasure for sure..darn duct tape, i bet Red Green was behind it! sorry. That's my biggest pet peeve. The software guy says its the cable, the cable guy says its the computer. When all else fails, I do the same... unplug everything and then replug. Typical response from Help Desk Personel that does more harm than good. The man should be reprimanded and or fired. I would notify the company, having a employee with this attitude not only harms the customer but the business. Sometimes all it takes is a power cycle of the internet modem and a reboot of the computer. Glad you are back online. Cox Cable Boy wouldn't last too long with that attitude where I work without a supervisor talking to him. With our company our customers are the most important thing. Doesn't Cox's website have a customer feedback link somewhere ???. I'd be emailing about "Cable Boy's" bad attitude. Sometimes all it takes is putting fear into them. The microsoft solution to everything. Turn it off, pull the plug. Plug it in. Turn it on. Sometimes it works. My papa was in the military and they had a flow chart to fix everything. This became second nature to him so whenever we had a problem the trouble shooting always started the same way. "Dad, my radio (hair dryer,etc.) won't work." "Is it turned on? Is it plugged in?" To this day i am continually amazed by how many problems those two little checks can solve. Congrats on the 'puter fix, quilly!